If no data is received from the device, the weight will be returned to SAP by ERP-Scale as zero. Tick this box if the SAP error RDC_ABAP_MESSAGE should be raised. This will cause an abort in SAP. The password field is increased from 8 characters to 40 characters in releases ECC6.0 onwards. As this is not supported by SAP OPC connector, in some systems the application of the following OSS note resets the field length to 8 characters. ERP-Scale supports the new 40 character passwords and the OSS note is not required. Select the length of the field in your system. Click the ‘Verify in SAP’ button to automatically set the length based on the configuration of your SAP system. 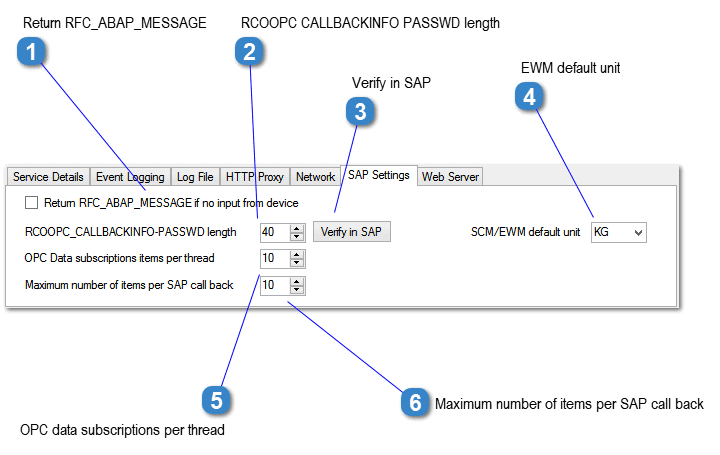 Click this button to automatically set the length of RCOOPC_CALLBACKINFO-PASSWD based on the configuration of your SAP system. When using the weigh button in /SCWM/PACK the RFC /SCWM/HU_WEIGHT_FROM_SCALE is called. If the data returned from the RFC includes the weight in a different unit of measure from the unit of measure of the HU, then error message /SCWM/HUFUNCTIONS037 is raised. However, the structure passed to the RFC does not include the unit of measure of the handling unit. If a unit of measure is selected here, all weights returned to SCWM from ERP-Scale will be converted to this unit of measure. Note: Ensure that a numeric conversion method is set in the ERP-Scale parsing settings for the corresponding data field. To improve performance, ERP-Scale creates multiple threads to manage the OPC data subscriptions. This field can be used to change the number of OPC data subscriptions per thread. When performing a call back to SAP for OPC data events, a number of items can be included in each call back.